← Mattel’s Food Fighters Variations – Now in Four Exciting New Flavors! Davy Crockett Coonskin Cap – “Born on a Mountaintop in Tennessee” – In the 1950’s Davy Sent Little Boomers on a Spending Spree! 1955 was a great year for Walt Disney. Disneyland opened that summer. The TV show “Mickey Mouse Club” premiered and Davy Crockett became a phenomenon that has rarely been rivaled since. “Davy Crockett”, starring Fess Parker in the title role first aired in December, 1954 as part of the “Disneyland” TV show. Chronicling the life of the real frontier hero, some might have questioned the historical accuracy of the three part series, but if you were a kid at the time, you really didn’t care much about that. Soon “The Ballad of Davy Crockett” could be heard everywhere and a merchandising superstar had been born. 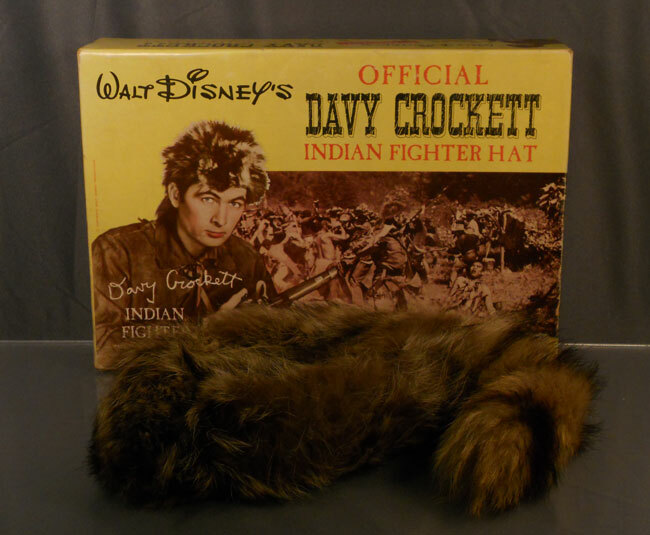 In the following year about $300 million worth of figures, playsets, wallets, watches, drinking glasses and just about anything else could be found with Davy Crockett emblazoned on it. But the thing that just about any kid wanted more than anything else was the hat. 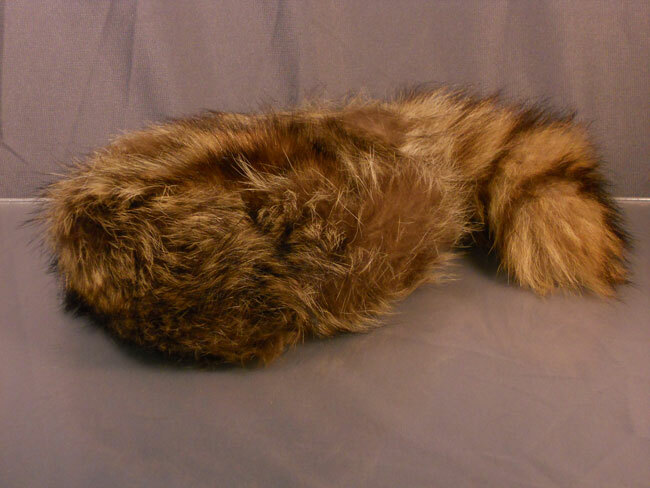 We all wanted a coonskin cap with a genuine raccoon tail hanging out the back. After all, that’s what set Davy apart from everyone else. I got mine that Christmas of 1955 and it was the genuine one that came in the box with Fess Parker’s picture on it. 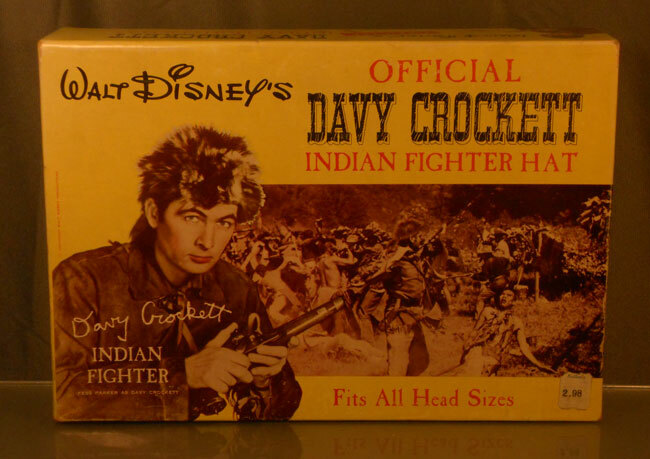 The box called it the “Official Davy Crockett Indian Fighter Hat”. Inside the box was a hat made of real animal fur. Let’s just say that 1955 was not a good year to be a raccoon. The term “Indian Fighter” would not survive our current wave of “political correctness” either. My original hat disappeared years ago – probably thrown out after my head got too big for it and the fad had come and gone. Fortunately about three years ago I was able to purchase another one from its original owner, a man who apparently never wrecked any of his toys. As with many old toys from my youth, the box was almost as good as the toy. In the case of the Davy Crockett hat, it was the only way to tell it was the real deal. I remember that my Davy Crockett hat had a round cardboard picture of Fess Parker attached to it which I suspect was detached from my current example years ago to make it look more realistic. The man I bought it from, however, claims that it never had anything attached to it. Disney would go on to make two more episodes for the Davy Crockett series and edit four of the five episodes into two feature length movies (in 1955 and 1956) but the fad had run its course. Soon Disney would give us “Zorro.” The sign of the “Z” could soon be found everywhere. This entry was posted in 1950's, Americana, Costumes, Disney, Jim, Toys, Uncategorized. Bookmark the permalink. One Response to Davy Crockett Coonskin Cap – “Born on a Mountaintop in Tennessee” – In the 1950’s Davy Sent Little Boomers on a Spending Spree!